Local people are campaigning to keep the paths across the golf course open. Local people in Speen, Donnington and Newbury are campaigning against proposals to divert three footpaths across Donnington Grove Golf Course. For many years, local people have safely used the footpaths between Newbury, Bagnor and Donnington. 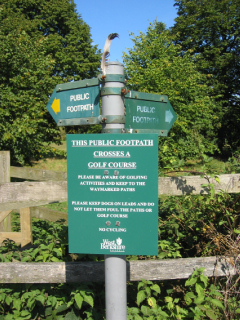 The new owners of Donnington Grove Golf Course are now claiming that the paths have become unsafe to use due to advances in golfing technology and have proposed that they be rerouted. This claim is disputed by local walkers and golfers. To our knowledge, only two people have ever been hit by a golf ball on the Donnington Grove Golf Course - and they were both golfers! They also claim that they need to shift the footpaths in order to allow them to bring a major golf competition to the site. However, this ignores the fact that temporary closure orders for major events are easy to get. Over 600 local people have already signed a petition opposing the proposed changes. Stop press: the final decision is now expected on December 8th, 2005. The Council Briefing on the proposals. The discussion on Newbury Forum. A public meeting is going to be held on the evening of October 17, 2005 at 7.30 pm to discuss the issue in the Robert Sandilands school. The Council and the Golf Course have been asked to send representatives and Richard Benyon MP will be trying to attend. If you would like a copy of the actual consultation letter or require further information please telephone the Rights of Way Officer on 01635 519070 or the Legal Officer on 01635 519416 giving your name and postal address. All responses are required by Friday 21st October 2005. The final decision is now expected on December 8th, 2005. You can also contact your local West Berkshire councillors via http://www.writetothem.com/. Sign here to add your name to a petition against the proposals to close the footpaths. Tick here if you would like to be kept up to date with the campaign. You can also help the campaign amongst people who don't use the internet, by printing out the attached petition form and collecting signatures against the proposed changes.